We are presenting the first international Deaf film festival in Hong Kong. Deaf films are those that have significant involvement of persons who are Deaf, as directors, actors, playwrights etc. Deaf communities in the world consider themselves as linguistic minorities and like ethnic minorities have their own language and culture. Sign language is the language of the Deaf and for a long time, the use of sign language has been suppressed, both in Hong Kong and the rest of the world – to the extent that the Deaf people consider that as linguistic genocide. The Declaration of Rights of Persons with Disability recently adopted in the United Nations has among other things, uphold the rights of the Deaf to their own language, the sign language. The Deaf have their own culture apart from their language and more and more of them have been making films to voice out and to express themselves. There are more and more international Deaf film festivals in the world as a manifestation of one aspect of Deaf culture. 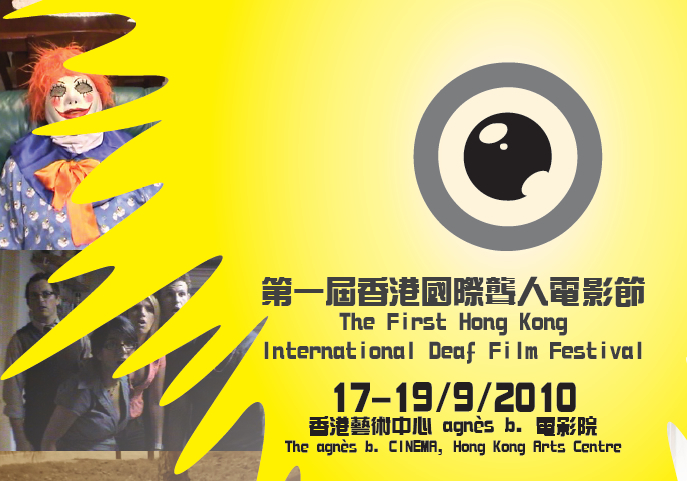 The purpose of the First HKIDFF is the attempt by the Deaf community in Hong Kong, represented by Hong Kong Association of the Deaf and many other organizations of the Deaf as well as those Hearing to showcase some of the best Deaf films in the world, as well as some made in Hong Kong. To views such films, it will be a first step to understand and explore Deaf culture, to build an inclusive society, and to appreciate the diversity in film making. 下載完整版場刊 (1) (2) Download the official Brouche (1) (2).